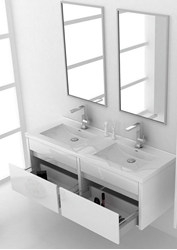 If cutting-edge contemporary design is your style then this bathroom set is for you - modern, chic and built to last. The cabinet is constructed using the Highest Grade MDF, Engineered for Moisture Resistance. The double cabinet has 4 spacious drawers featuring Blum soft close sliders ensuring they close silently and effortlessly every time. This wall hung unit has been designed to be installed very easily. It comes supplied with wall brackets which fix to your wall, you then hang the unit onto the brackets using the brackets which are fitted to the cabinet. This model is also available in 600 mm L, 900 mm L and 1200 mm L in all above colours. Matching tall cabinets and compact side cabinets are available.